When it comes to stroke, every second counts! Nearly 2 million brain cells die each minute a stroke remains untreated. Rapid access to medical treatment often times make the difference between full recovery and permanent disability. Know the signs of a stroke and act F.A.S.T. (face drooping, arm weakness, speech difficulty, Time to call 911 if someone is having a stroke. Stroke can happen to anyone at any age. 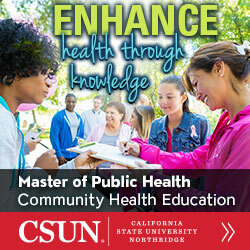 80% of all strokes are preventable. 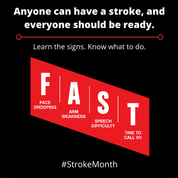 Stroke is the fifth leading cause of death in the U.S. and a leading cause of severe disability. On average, one person dies from stroke every 4 minutes. More than 795,000 people have a stroke each year in the U.S.
Stroke kills almost 130,000 of the 800,000 Americans who die of cardiovascular disease each year—that’s 1 out of every 19 deaths from all causes.